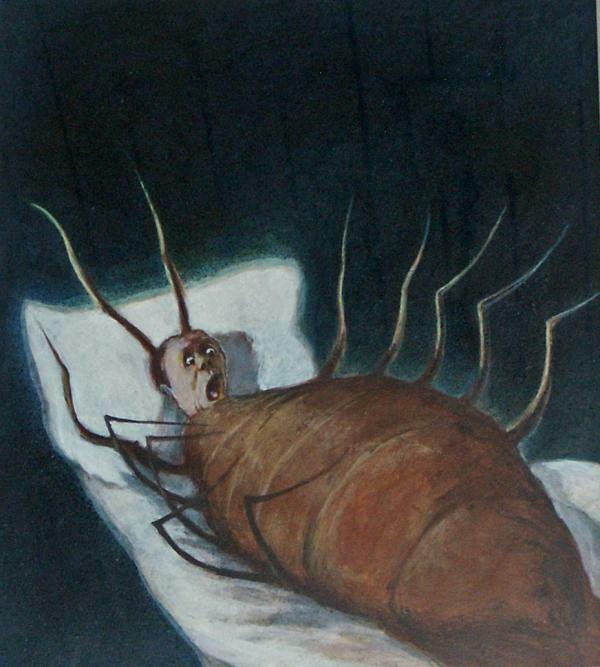 Gregor, the main character, awoke to discover that his body had been transformed into an insect (though we do not know what kind, nor do we know how or why this has occurred). Gregor behaved like an insect and did not speak a human language, but his mind was all his own. He did not seem overly concerned about his new condition; he just tried to survive in his new body - which amounted to being confined to his room, climbing the walls, or hiding under the couch in the living room. Since Gregor lived with his parents and younger sister, they were somewhat inconvenienced by his new condition, particularly because he financially supported the household. His sister was especially compassionate toward him after the transformation, though it did not last long. Meanwhile, without Gregor's income, both of his parents were forced to return to work, and it actually proved beneficial because their health and well-being improved. When the family took in three boarders to supplement their finances and the boarders saw Gregor, they immediately left disgusted. Hence, the family wanted to move into a smaller affordable apartment, but because of Gregor, they felt trapped. Gregor was a burden and nuisance. Hearing all of this condemnation about himself from his family, Gregor remained in his room (unable to communicate with them and injured by a piece of fruit his father threw at him) where he starved to death shortly after. And if you need to know, his family was totally relieved by his death; they got on with their lives, and even noticed the wonderful transformation of their daughter into a talented, beautiful young woman. As a reader, you may be curious to figure out what the purpose of this story was, but I found it entertaining enough. It was or is a wacky, crazy, bizarre experience. That's Kafka. 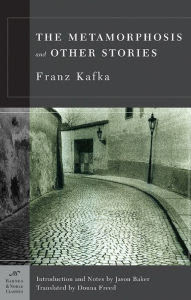 I have read only one other Kafka, The Trial, and it was a similar feeling. If you enjoy disappearing into strange, unnatural worlds - like dreams - then you will appreciate the storytelling ideas of Kafka. I know he was deeply political, and his stories have philosophical meanings; but this one I am going to remember for its weirdness from the mind of Kafka. I saw in your own post that you said you were a literal reader, so, yeah, Kafka may not be enjoyable. As I said, it is like being in a dream state - or nightmarish state. Haha! I haven't read Kafka yet, but your "That's Kafka" remark reminded me of one of my favorite moments in one of Jasper Fforde's Thursday Next books where someone has to be on trial in the courtroom from The Trial, and everything is completely random and wacky, and by the end, the antagonist yells, "This is insane!" and someone else replies, "No, this is Kafka." I love that moment, and it makes me kind of want to read Kafka, but I haven't yet. Look how random this comment is! Is it Kafka-esque? I don't know! My first Kafka was The Trial. You may want to start with that. Or if you rather not invest too much time in getting to know him, this short story (The Metamorphosis) would give you a good taste of Kafka. Have you read Nabokov's lecture on this novella? No, I had not, until you said something. I found a Youtube clip of it, and enjoyed it very much. Thanks for informing me. I like the idea that Gregor had wings (that he did not use). Had he figured it out, would he have escaped his apartment and been free from the life he [felt] trapped? That's how I considered it. Makes me think about Metamorphosis a lot differently. I think this is a story about Kafka coming out with his homosexuality. It's no accident that Kafka and Samsa are virtually the same name. They are both of the same age (at the time of his writing it), and Kafka moves out of his family home at the same time as Samsa dies and physically leaves. He was in Germany at the time (fortunately for him, he was dead before the Nazis did their thing), but it doesn't change the fact that homosexuals and Jews, and homosexuality among Jews, were considered degenerates and subhuman. Great cartoon btw. Sums up the novella very well. It is not easy trying to make sense of this one by Kafka w/o using other source helps. I didn't even try, obviously, and I didn't even do any research on it. Did you research Kafka's ideas for Metamorphoses or is this a suggestion? Even if it is just your thoughts, I think it works very well as an explanation. I should probably look into it, out of curiosity. Thanks for your comment.